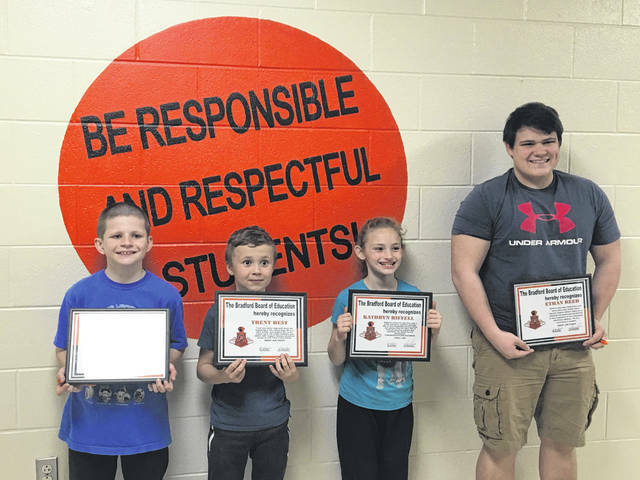 From left to right, students Johnny Stewart, Trent Best, Kathryn Riffell and Ethan Reed were recognized during the Bradford Board of Education’s student spotlight on Monday evening. From left to right, Larry Yount, Naomi Yount and Mary Alice Yount were recognized during the Bradford Board of Education’s volunteer spotlight on Monday evening. BRADFORD — The Bradford Board of Education on Monday approved pay increases to classified staff members that will mirror other pay increases previously approved for certified staff members. The board approved a recommendation to give the same pay increases to classified staff members that were approved for certified staff members that the board approved when they accepted a new contract with the Bradford Education Association in March. Classified staff members will be paid according to the salary schedule relative to their respective position. Steps for the affected current employees from the 2012-13 pay freeze will be reinstated effective July 1, 2019. Also effective July 1, 2019, classified employees will have a 2.5 percent increase in their hourly pay rate. Effective July 1, 2020, classified employees will have a 3 percent increase in their hourly pay rate, and they will receive another 3 percent increase in their hourly pay rate in July 2021. Later during its meeting, the board approved a resolution designating the week of May 6-10 as Staff Member Appreciation Week. Also during its meeting, the board approved two technology contracts. The board approved a contract with NextStep Networking for an amount not to exceed approximately $37,404. Superintendent Joe Hurst explained that NextStep Networking will provide networking hardware and that an E-rate grant will fund purchases through this contract. He added that the district does not expect to spend that full amount. The board later approved a master service agreement between Meta Solutions and the district in the amount of approximately $10,462. Meta Solutions provides infrastructure for the district’s internet access. The board also approved the district’s EPC Health Plan renewal with an increase of 17 percent from the current plan premium. The plan is effective July 1, 2020. The board later authorized 2019-20 membership in the Ohio High School Athletic Association. During the student spotlight, student Kathryn Riffell was nominated by elementary teacher Ann Siefring. Elementary School Principal Michelle Lavey read Siefring’s nominating statement about Riffell, saying, “Each day she comes in with a smile and a great, positive attitude … She comes in ready to learn and shows much respect toward her teachers and classmates.” Siefring went on to write that Riffell “pays close attention, participates, and always tries her best” and that hard work is paying as Riffell has shown growth in her reading skills. Elementary teacher Kim Newton also nominated student Johnny Stewart for the student spotlight, saying, “Johnny is a great helper and is always kind to others.” Newton said Stewart “participates in class and always puts forth his very best effort” and has an “eagerness to learn.” Newton also said that Stewart enjoys math, loves gym class and wants to create video games when he’s an adult. Elementary Literacy Team teacher Nicole Hackett also nominated student Trent Best for the student spotlight, saying, “Trent has really improved working with me this year.” She went on to say to that Best has “put forth the effort and worked hard” in his reading improvement. “He’s also treating children and adults with respect all the time,” Hackett said. The district also recognized three volunteers, Larry Yount, Naomi Yount and Mary Alice Yount, during a volunteer spotlight. Later during their meeting, the board also approved the following donations: $250 from the Greenville Lodge of Elks for school supplies; $30 from Christy Lewis for light covers to help dim lighting for autistic students; $500 from Covington Savings and Loan for a scholarships; $3,500 from BD Transportation for scholarships; $4,000 from Production Paint Finishers for scholarships; $100 from Darrell Gambill for the engineering class; $500 from Bradford Fire and Rescue for scholarships; and $2,967 from the Bradford Athletic Boosters for football helmets and pads. The board ended its meeting by going into executive session to discuss personnel. This entry was tagged Bradford, Bradford Board of Education, Bradford Education Association. Bookmark the permalink.